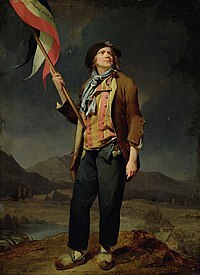 Early use of trousers in France: a sans-culotte by Louis-Léopold Boilly. Trousers (or pants in Canada, South Africa and the United States), are a kind of clothing. They are worn on the lower part of the body, to cover both legs apart (instead of cloth stretching across both as in skirts and dresses). Historically, in the West, trousers have been the lower-body clothing item for men since the 16th century; by the late 20th century, they were used sometimes by women as well. Trousers are worn at the hips or waist, and may be held up by their own by a belt, or braces (suspenders). The Simple English Wiktionary has a definition for: trousers. Wikimedia Commons has media related to Trousers. This page was last changed on 25 January 2017, at 19:21.